One of the most popular and interesting saltwater fish that is often considered as an addition to the marine tank setup is the Butterfly Fish. There are actually different species that belong to the same group with some that can easily adjust well to home aquarium water environment and also adapting to changes without showing sign of developing complication, while there are some species that will die even when the best living condition is provided. 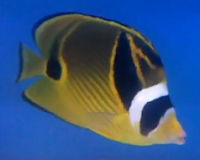 With that in mind, there are only few selections of butterfly fish suitable to be kept in captive aquarium system. According to journals and marine resources, there are actually almost 120 butterfly species that have been categorized and identified thus far. Out of those, there is only a handful which can be described as “hardy” for home aquariums while the rest are generally unsuitable to be taken in as pets. All Butterflyfishes are grouped together to form the family Chaetodontidae and each of them share few similarities such as having a flat body with a square shape appearance and their mouth is rather small extending a certain length like a snout. Different species are found in different regions of the sea and the adult fish in the wild is usually about 10 to 12 inches in size. Some of the most common and so-called hardy butterfly fish that I would recommend to advanced marine aquarist generally comprises of longnose, copperband, teardrop, pyramid, raccoon and threadfin fish. Usually the best aquarium setup to house your pets should have a system well-equipped with protein skimmer and coral sands, which acts to control the pH within 8.2 to 8.5 while the temperature should stick to the 78 to 85 degree Fahrenheit range. Apart from that, a powerful filter system should also be present because without these, you will have a hard time maintaining perfect water quality. 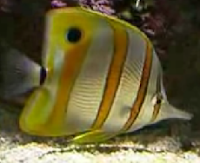 Mixing your butterfly fish into a saltwater community tank should be done with extreme care. A good rule of thumb would be to avoid basses, lionfish and triggers while tang and angelfish might be fine provided that your reef system is large enough for each fish to thrive well without disturbing one another. When it comes to breeding your butterfly fish, little information is known about how the whole process works out and it’s very rare to hear success stories of marine pet hobbyist who has successful get the fish to spawn in captivity.